WOA tablets: who and when? Windows 8 for ARM tablets will come out at the same time as Windows 8 for x86 PCs, if everything goes according to plan. Microsoft has released full details on Windows on ARM today. It will have the Windows desktop, with familiar apps like Explorer, Internet Explorer and the Windows Live apps, plus Office – but everything else will be Metro. And no, you won't be able to install it on an Android tablet. Microsoft is revealing the technical details of Windows on ARM – which it calls WOA for short – today. TechRadar talked to Windows chief Steven Sinofsky about what WOA can do, when and how you can get it and which apps it will and won't run. "Windows on Arm, WOA, is a new member of the Windows family that is built on the foundation of Windows," Sinofsky told us. "It has a high degree of commonality, a very significant amount of shared code with Windows 8. It's going to be developed for, sold and supported as part of our overall Windows ecosystem." But he didn't want us to think about WOA systems as just PC with a different chip. "We created WOA so that it would enable a new class of PCs with unique capabilities and form factors. It's a new level of device." Think of it as a new weapon for Microsoft in the tablet battle. "It's up-levelling our ability to meet the consumer demand for a device that is reliable and performant over time. The canonical example is the reset and refresh feature and the difference between that and a clean install." By that, he's talking about the end of 'Windows rot'; a WOA PC won't gradually fill up with cruft and get bloated and sluggish the way older versions of Windows are prone to. A WOA PC will stay snappy and responsive thanks to apps not being able to run in the background. If it gets cluttered with too many apps you don't want, you can reset it to get rid of them without losing your pictures and files. There's no more hunting for the specific version of a driver that your PC needs on badly organised support sites. "All the updates, whether for firmware, drivers or apps, will only come through the Windows Update or Microsoft update infrastructure and the Store. And, of course, it will have long battery life in a thin and light design with strong security and powerful applications. It's Windows, reimagined the way Microsoft thinks you always wanted it to be. "All Metro-style apps will run on WOA just like you would expect," Sinofsky confirmed; "it's the same experience". Those are apps written in HTML5, VB, C# and XAML – and in C++ if developers prefer. That's the language most x86 Windows programs are written in, though you can't just turn an existing x86 Windows app into a Metro app (which would be a bad idea for a lot of different reasons). "You can reuse all your code from existing apps if you want, so long as you only call WinRT APIs. If your app is going through the store and uses the WinRT APIs then it too can work on WOA and we'll provide the tools to cross compile that." WOA will come with what Microsoft has previously been calling the next wave of Windows Live apps for Metro, hardware accelerated for speed (the way IE9 and IE10 are), already installed. "We'll have apps from Microsoft for things like mail and calendaring and contacts and photos and storage, hardware accelerated HTML5 and a whole bunch of media formats and document formats - that all support hardware acceleration, that support offloading of computation to integrated chipsets for H264 and things like that. And all of those are included as part of WOA." Plus you get touch-centric versions of Office (with the notable exception of Outlook), and the desktop you need to run it on, on every WOA PC. "The other kind of app that's included for WOA are the Office 15 apps: Word, Excel, PowerPoint and OneNote. These are all desktop apps. They're new versions that are completely compatible. They're not subset applications, they have the same file format - all of that stuff. With that of course, you also get the Windows desktop itself; for working with files, for control panel for working with devices and peripherals, Explorer, desktop Internet Explorer - all of that is part of the WOA product." Given that the Microsoft Metro apps include document viewers, getting desktop Office apps is a good thing; you'll use them when you need to work with a document in detail, not just glance through it. 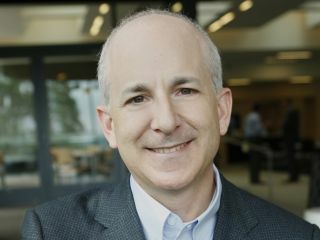 He didn't give us any details about the user interface for Office on WOA but Microsoft has put a lot of effort into making them work well on a tablet, Sinofsky said. The Office apps "have been retuned very significantly to support touch and to support the low power requirements of running on the WOA hardware." That's a good reason why there won't be desktop apps on WOA from any other software vendors, just Microsoft. The machine learning Microsoft has used to make the desktop and apps like Explorer work well with touch in the Developer Preview, even when you're dealing with a tiny button, is beyond the scope of many developers - so user interfaces in existing Windows programs would be a bad fit for WOA. Just recompiling an app would give you a program that would probably run slowly, use a lot of battery life, be hard to use and wouldn't use new WinRT features like unified search and share. Expert users or developers can't get around the restrictions. "There's not a side-loading of x86-compatible code or anything like that. There's no other way to get compiled code on the product other than through the Store." Not allowing third-party desktop apps makes sense but it certainly has implications. Microsoft wouldn't confirm it, but we believe this means no browser plugins for desktop IE on WOA. There's no official word on Media Center for WOA either. So to sum up the app situation. "You have Metro style apps that can come from third parties and from Microsoft, you have the desktop and you have all the features that are intrinsic to Windows, and you have Word, Excel, PowerPoint and OneNote apps." Next Page WOA tablets: who and when?